← How to share flip books? VeryPDF Flipbook Maker enables you to make flip book from images in formats including JPG, JPEG, PNG, TIF, TIFF, and GIF. It also allows you to trim images. This article share some tips with you on how to trim images and convert images to flip book. Supported OS: Windows 2000 / XP / Server 2003 / Vista / Server 2008 / 7 / 8 of both 32 and 64-bit. Input formats: JPG, JPEG, PNG, TIF, TIFF, GIF, PDF, DOC. PPT, XLS, RTF, SWF. Output formats: HTML, EXE, APP, ZIP. Click here to Download VeryPDF Flipbook Maker. After download load Flipbook Maker, please follow the instructions in the setup wizard to install this tool on your PC. 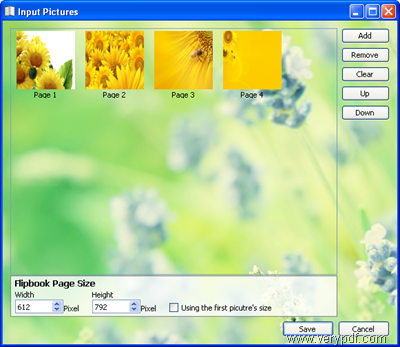 Then, you can use this tool to generate flip book from images and publish the result flip book online. Just double click the icon on your desktop to launch Flip book Maker. Click the Input button on the tool bar at the top of the main interface to open the Input dialog box. Click the second radio button under Input in the Input dialog box. The Input Pictures dialog box as following appears.You can click Add at the right part of the dialog box to input images. Then, you can preview the images in the list box . If you want to use the first pictures size as the result flip book page size, please click the check box under Flipbook Page Size. You can also change the first image by clicking the buttons Up and Down. If you want to set exact page width and height, you can type numbers in the boxes under Width and Height. You can set background and buttons for the flip book by selecting options in the left tool panels. The first panel at the left part allows you to set background and buttons. 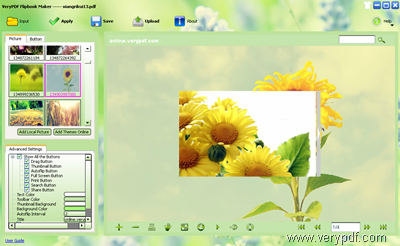 You can import background pictures and buttons from your local disk or you can download online themes. The second panel allows you to add music, flip sound, a watermark to the flip book. You can also choose to hide some buttons by setting options there. You can create flip book from images and save them on your local disk. Or you can publish the flip book online, and store it on the online service of VeryPDF. For storing flip book on PC, please click Save on the tool bar at the top of the main interface. For storing the flip book online, please click Upload. If you want to view how to publish flip book online, please read the article How to publish flip books online? Is this article helpful? Do you have any questions? Please fell free to contact us. This entry was posted in Flipbook Maker and tagged flip book from image, Flipbook Maker, make flip book. Bookmark the permalink.